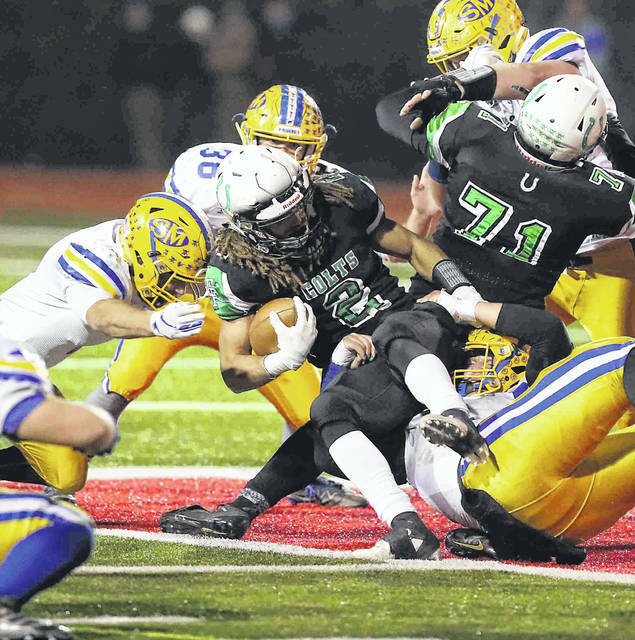 Several members of the St.Marys defense, including Sean Perry, left, and Eddie Fowler (39) stop Clear Fork’s Trevon Trammell during last Saturday’s Division IV, Region 14 final in Bellefontaine. ST. MARYS — It is Monday afternoon and the St. Marys locker room is stirring around. Players began to get ready for a light practice and film study session. Inside the coach’s office, Doug Frye is pouring over film on his next opponent, Cincinnati Wyoming, a team he knows little about and hoping to gain as much insight into the Cowboys before the two square off in the Division IV state semifinal game at Piqua Alexander Stadium at 7 p.m. Saturday. What Frye does know about the Cowboys is they are the No. 1 ranked team in Division IV that has not lost a regular season game since 2015. What Frye also knows is that the Cowboys are averaging 42.6 points a game and giving up an average of seven points a game on defense. Wyoming has shut out four of its opponents this year, including last week in the regional final when they blanked London 28-0. In their three playoff wins, the Cowboys have outscored their opponents 96-24. Frye also sees a dual threat quarterback, Evan Prater, that it is a difference maker. The junior signal caller has passed for 1,844 yards with 23 touchdowns and four interceptions and ran for 1,395 yards and 27 touchdowns this season, including playoffs. Senior Joey Edmonds is the Cowboys’ top receiver with 43 catches for 812 yards and one touchdown. On defense, Frye must prepare for linebacker Hasan Black with 95 tackles and 8.5 sacks and defensive lineman Harrison Shepherd with 55 tackles and 6.5 sacks. As a team, the Cowboys held teams to an average of 121.9 total yards and limited teams to an average of 36.3 yards on the ground. Frye did face Wyoming back in 2003 in a first round playoff game that saw the Cowboys beat St. Marys 18-16. Frye remembers that a lateral play between then players and now coaches Bo Frye and Nick Yahl was called back that could have won the Riders the game. Frye said in addition to the film preparation the team has engaged in some light practices to gear up for the game. In order to keep the team focused and mentally sharp, Frye said it is imperative to keep the players excited about playing considering the fact that these athletes have been working since July. Frye added that the main focus is getting ready “above the eyebrows,” as the team watches a lot of film. With Thanksgiving sandwiched in the week, it might pose a distraction for some teams but Frye said his team is a battled-tested mature squad that is embracing the opportunity. Coming off last week’s impressive 38-7 win over Clear Fork, Frye understands his team is doing the right things at the right time and it showed in the victory. Frye added that he thinks because of the the Riders’ depth upfront that they wore down the Colts in the final 24 minutes. The keys to winning remain the same for Frye and Co. and that is to win the plus/minus turnover ratio and to find an advantage in the special teams area. “We will have our work cut out but when you reach this point the challenge is going to be big,” Frye said.